One of the most versatile and economically efficient cameras out there today, a.k.a. 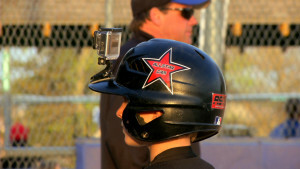 the GoPro action camera, has been a staple to All Star Video Sports’ growth as a video company since the device was introduced to the public. As discussed in another Wheelhouse Blog article, we have always had a wide variety of cameras and camera systems that have allowed us to shoot state of the art video for our recruits and players we highlight. That being said, there are some clear advantages and disadvantages to using a GoPro camera on a regular basis in our line of work. For All Star, the GoPro is a camera we can use to get the fun shots…the shots and angles that could not really be captured on any other video camera. 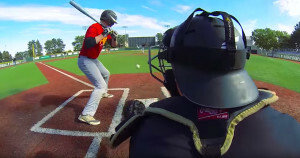 We have used the GoPro to capture video from a drone in the sky, to the unit being strapped to an athlete’s head, to it being placed on a bar bell while an athlete was lifting, to it being connected onto an Umpire’s helmet during a game. These are the things that no other camera in the world can capture. For creating the highest quality recruiting videos and highlight videos, this camera has been indispensible with its ability to generate out of the ordinary shots of video. A perk of using the GoPro camera is the size of the unit. Since the camera is no larger than the size of one’s palm, this makes it virtually the easiest camera on the planet to manipulate and transport. 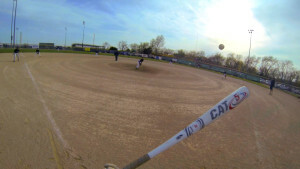 The GoPro is also versatile in the sense of it allows the user to shoot video of anything you could possibly think of. Whether you are a professional like us shooting an intense sports highlight video, or a business company getting office shots, or a skydiver flying through the air, or you are just making a home video for you and your family to view for years to come, it allows you to shoot video of just about anything. The best thing about this camera though is the quality of the video it produces in relation to how small and easily accessible it is. Manycompanies have tried over the years to create the world’s smallest camera, in addition to it having the best quality possible on that camera. No other company has had success with these two characteristics together until the GoPro was invented. On the flip side, there are some disadvantages to the GoPro. First off, there does tend to be a learning curve when attempting to first use the camera. The settings system is not always easy to navigate and that can spell trouble for the “recreational camera user”. Traditionallly, the GoPro also shoots video in a very wide shot type of angle. With no control over the zoom, shots can often be missed due to the inability to get closer to the objects that are farther away from the camera. Playback can also be an issue, as there is no ability for you to look at clips you have shot on location with the GoPro. The GoPro camera clearly has its advantages and disadvantages, but when we are trying to get the un-gettable shot, this camera is definitely the one to turn to.